Dartmouth College President Philip J. Hanlon's decision to nix the appointment of Bishop James Tengatenga as dean for moral and spiritual life has sparked spirited commentary from left and right -- and some solid reporting. An article in the Boston Globe entitled "Words on gays cost bishop post at Dartmouth" is a well sourced, balanced story that succinctly summarizes the issues at play. In other words, we are cheering for a solid story on a difficult subject that is often mangled. The article points out the irony of Dartmouth's refusal to countenance any deviation from conventional wisdom in the name of "tolerance" -- but it does this not by being preachy, but by allowing both sides to speak. Supporters and opponents of the appointment can recognize their views in this story, and it is left up to the reader to discern where the truth (and justice) lies. I was particularly impressed by the Globe's sources from within the Anglican world. The commentators, while drawn exclusively from the liberal wing of the church, were first class. And the newspaper broke free from an America-only perspective, offering voices from America/Britain as well as Africa. True, voices representing the views of the vast majority of African Anglicans were missing from this story, as was an explanation of these views -- why does homosexuality evoke such strong moral and social disapprobation in Africa? Why do politicians use homosexuality as a club to beat their opponents? But does this represent a failure to "Get Religion?" Were I the author of the piece I would have placed more emphasis on the religious/political culture from which Bishop Tengatenga arose, but the "I would have done it differently" argument is not about criticism but is a matter of taste. The rules of the craft -- balance, context, detail, integrity -- were all met by this well written piece. A note of disclosure is in order though. I was peripherally involved in this mare's nest. I contacted Bishop Tengatenga and asked him to confirm the story -- and he responded it was true, but added he was annoyed the newspaper had printed the story without checking with him. He had yet to finalize the deal with Dartmouth and had not yet received his visa. I wrote up the first Western account and thought that would be that -- a mildly interesting people/places story of interest to church insiders and the Dartmouth community. I first met the bishop in 1998 and had written a number of stories over the years about his work in Malawi and within the wider Anglican Communion -- which he served as chairman of the Anglican Consultative Council -- a pan-Anglican agency that seeks to foster conversation among the disparate churches of the communion. 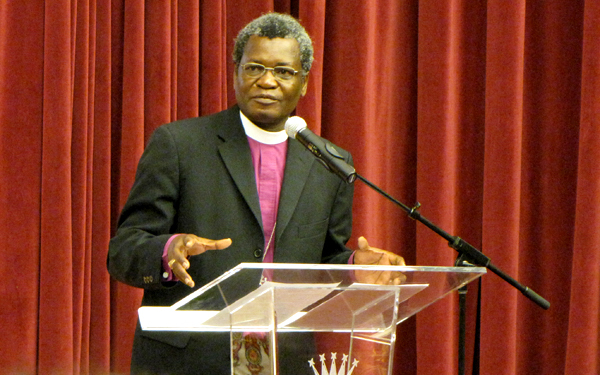 Bishop Tengatenga had earned the trust of the liberal churches of North America and Europe, who saw him as a fair, impartial chairman. Within the sharply divided world of Anglicanism, Bishop Tengatenga was one of the few leaders who could move between the conservative and liberal camps and be received and respected by both sides. The bishop had also gained a reputation as a fearless opponent of corruption and political tyranny in Africa. When political leaders in Malawi sought to demonize gays -- following the lead of Robert Mugabe in neighboring Zimbabwe to deflect attention away from failed government economic and social policies by selecting a scapegoat, the bishop forced the government to face up to its actions. I should note that this sort of thing gets one killed in Africa. I've written stories about bishops dying in mysterious car crashes, or being jailed and harassed after they campaigned against their governments. Anti-gay campaigns in Africa, I should add, have little or nothing to do with homosexuality. In African politics homosexuals play the role Jews played for the Nazis in Germany, or Kulaks for Stalin, or the Chinese in Indonesia, or Israelis play for Islamists -- a propitiatory sacrifice for the mob. (Calling René Girard) Nor should we assume that America's gay culture is the model for the gay cultures of other societies. The world just does not work that way. But back to our story. Gay activists at Dartmouth began an internet search on Tengatenga and came across some of the stories I had written for the Church of England Newspaper over the years. Quotes were lifted from these stories that seemed to contradict the bishop's current views. A member of the Darmouth search committee telephoned and asked me to help them understand the context and meaning of the stories. The bishop had told them his views had evolved over time and he had given them a nuanced statement of his beliefs -- affirming his Christian faith and his views on equality. James Tengatenga, by his own profession, was now a liberal Anglican. Had the bishop modified his views to mollify his critics?, they wanted to know. Paris may have been worth a mass, but was Hanover NH worth a wedding? I thought not -- but could not speak to the bishop's beliefs. The idea of the left taking care of their own calls to mind the Republican friendly fire of the Spanish Civil War. In this case, the left refused even to recognize him as one of their own. He unwittingly and in circumstances scarcely imaginable here violated their language code; their own moral pride compelled them to relegate him to the status of outcast, unfit to exercise moral leadership in our community. I don't think my perception is entirely distorted when I notice a Leninist streak in the American liberal arts left. But as for the journalism ... Kudos to the Boston Globe for making a difficult story coherent. Well done.